The Washington, DC, office of Perkins+Will was designed as part of transformative process recasting the practice into the future. It is also a manifestation of a core value – our global responsibility towards future generations – that brings meaning and purpose to the way we practice. The project team focused on creating a space to “demonstrate and promote collaboration and excellence in design with a particular focus on broadly stated sustainability.” It aimed to integrate a contemporary open aesthetic with functional and programming requirements in an environment fostering employee wellness and exceeding energy savings of typical tenant improvement design. The goal was to increase conferencing and collaboration, enhance amenities and environmental qualities of the space, and reduce the size and energy load of the facility. Minimizing needs became the first task prior to the technology solution. As a result, the workplace was transformed from an enclosed and clustered environment to an open studio fostering open communication across all levels, exposes process, and reinforces our commitment to sustainability. The project achieved the LEED ID&C Platinum version 2009 accreditation level in a building whose owner is also committed to sustainability. Particular care went into finding a suitable building that would maximize design opportunities and a landlord that shared the values of minimizing energy load and through infrastructure that exceeds established standards. The design team knew that pushing the limits on the energy efficiency, indoor environmental qualities and employee wellness, the location, floor plate configuration, and provisions of the lease agreement needed to align with project goals. “Green Lease” provisions on the tenant side were tirelessly negotiated by an attorney with LEED accreditation. His work was supported by the integrated design team that included the general contractor and all consultants from the beginning. Specific points of focus included landlord commitment to future certification of the building within the LEED EB program, modifications to the building infrastructure to accommodate innovative technology, and maintenance support of the non-standard fixtures and equipment. Access to the roof and placement of the passive solar technology was also in the lease agreement. 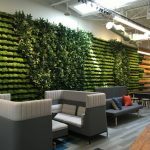 The real-estate strategy also included enhancing employee comfort through a healthy work environment with ample workplace amenities including access to a childcare facility in the same building, ample public transit options, and proximity to a public park. 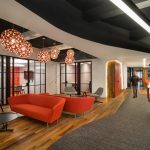 The new location is just five blocks from the previous space, offering employees a solution minimizing the stress of learning new commuting patterns and neighborhood amenities. Overall reduction of resource use became a priority. Through use of a tenant-only energy management and monitoring system, specific portions of the energy use; lighting, VHAC or computer, and network related loads are monitored. This gives the operations team specific real-time metrics on how the systems are performing. As an innovative feature, reporting functions of the energy management system include a display at the reception area where tenants can monitor actual energy use and in response modify uses they can control. The system is also part of the firm wide network that stimulates friendly competition between offices, further enhancing energy saving positive behavioral patterns. Such patterns are supported on the corporate level with the commitment to the 2030 carbon emission reduction challenge, support of teleworking, and setting goals for USF per employee standards, verified through the GRI reporting standard. Catering practices preferably include all china and cutlery settings and otherwise, all biodegradable settings and utensils are required. Copiers have a 2-sided printing default and most projects moved towards the integrated web-based document exchange and project management. The office was designed to support a robust recycling program with all major recyclables collected and sorted at the user level. The plan is to include collection of the biodegradable material for composting following successful examples in other offices. A firm-wide competition is held once a year to divert as much recyclable material as possible. Although a singular event, it has a transformative effect setting possible goals for daily operations. The use of public transportation is supported by direct subsidies. The firm holds a year round “bike to work” challenge that culminates at the time of the national event every spring. Evidence-based design metrics led to personal work environments designed around collaboration between two people as the optimal physical basis for project interaction and professional growth. Flexibility is a critical part of the program. The ergonomic work stations are arranged in flexible team-based rows that alternate with work/storage islands. Employees received personal training session with an ergonomic specialist on use of work station components. Work stations are portable; staff members simply roll their personal file drawers to a new location with an identical work station setup when teams change, reducing move time from hours to minutes. Collaboration areas dot the studio, including work station conference tables, mini-lounges, and drawing/work tables with built-in collaboration nooks. Communal spaces—including the library, cafe, and main entrance—face an interior atrium, providing natural light and views of an 8-story art display. Careful programming reduced the office footprint, the library was maintained, and the conferencing facilities were doubled. There are a handful of private offices for employees who spend a majority of their time on “heads-down” tasks or handle routinely confidential matters. A fascinating observation is the self-regulation of studio dynamics. Acoustical privacy – one of the principal concerns in the open studio environment – was addressed through careful shaping of the space and, as importantly, the adjustment of its inhabitants’ mindsets. Team members saw the benefit of hearing and learning from the interactions around them – seat assignments are project based providing engagement throughout the day. Designated conference space needs subsided by about 35 percent – designated rooms are rarely used to talk about project issues – we do it real time when they occur. The color palette is light and neutral with limited accents of domestic wood veneer providing a uniform canvas for art and enhancing day lighting opportunities. Rapidly renewable materials and those with significant recycled content were selected, maximizing the available LEED points. Healthy indoor air quality is achieved with low-VOC materials and an indoor air quality (IAQ) management plan during construction. In alignment with the Perkins+Will’s sustainable goals, building materials used in construction were carefully reviewed to eliminate harmful substances still found in commonly used building materials. Of the furniture that was not reused, 100% was diverted from landfills and donated to local non-profit organizations. The studio is bathed in natural light from east-facing floor-to-ceiling windows, providing daylight harvesting opportunities. Projections are to reduce from baseline levels overall energy consumption by 35%, utilizing the dedicated energy management and reporting system, sub-metering, and a stand-alone solar hot water system. Solar hot water panels are combined with photovoltaic array that facilitates the power for the associated pumps. Low-flow and waterless fixtures were installed. A large percentage of the lighting uses LED’s and dimmable controls, furthering the savings. As a result, water consumption was reduced by 40 percent, and lighting power by 35 percent. Ninety-five percent of construction waste was diverted from landfills. The office buys 100 percent green power. Conference rooms include SMART boards, VTC infrastructure, movable white boards, pin-up space, and mobile, reconfigurable furniture with built-in digital connectivity throughout. These strategies give the client firm wide, face-to-face, instant collaboration, further reducing the overall carbon footprint. Designed as a prototype for other projects within the firm and for outside clients, the office serves as an open laboratory with weekly tours, lectures, and demonstrations offering inspiration and a point of reference to the clients and real estate professionals in the DC area.